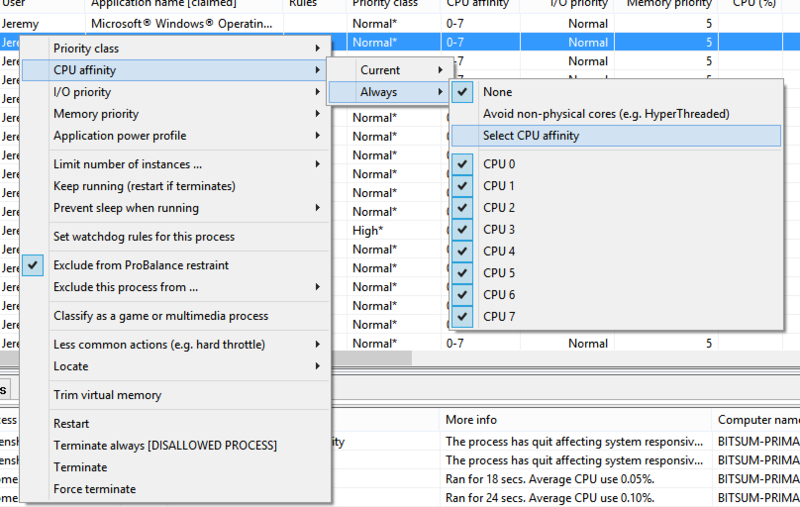 Imagine a world where you can set process priorities, process CPU affinities, and more, having those settings persist! This is one of the abilities of Process Lasso’s unique automation capabilities. Take control of your PC through your own manual rules, or let Process Lasso’s automated algorithms do it for you. 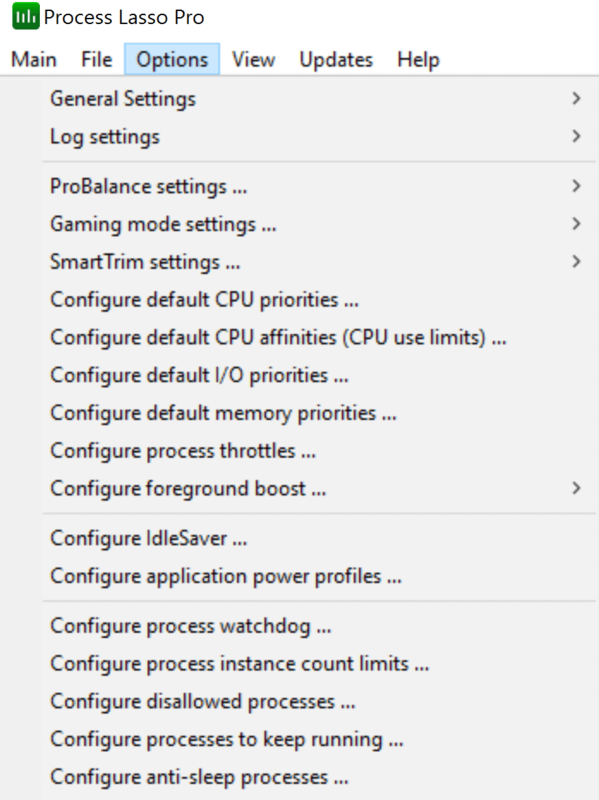 ProBalance Our famously efficacious algorithm to restore PC responsive during high CPU loads has to be listed here, too. This is one of the few optimization algorithms in the PC software genre that can actually be demo’d in real-world and synthetic tests. You can even run the demo yourself! For more information, see How ProBalance Works. 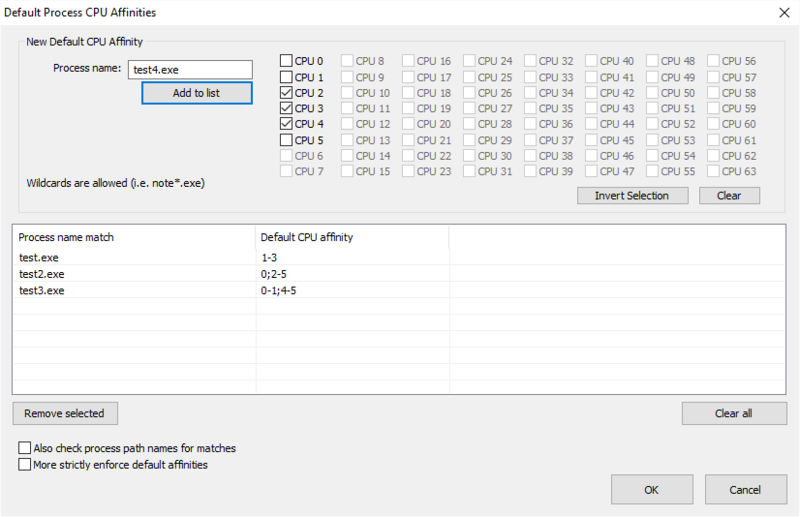 Persistent CPU Affinities Set persistent CPU affinities so that processes run on the desired set of CPUs every time they launch. 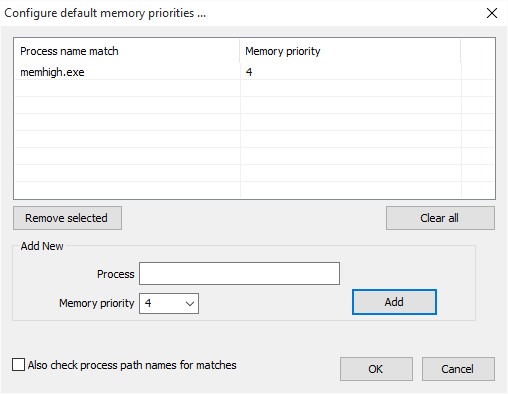 Persistent Priority Classes Set persistent CPU, I/O, and memory priorities so that processes run at the desired priorities every time they launch. Disallowed processes Immediately terminate any matched process, by your criteria. Limit instances Limit the number of instances a process may have in a user session. 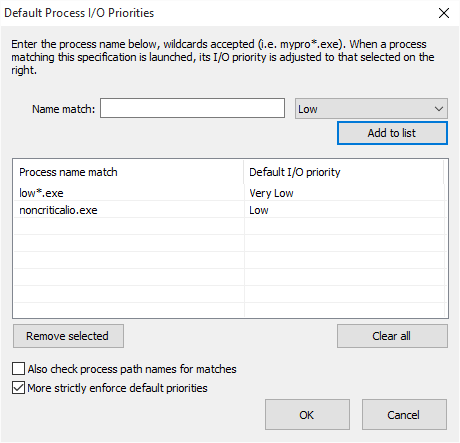 Keep process running Automatically restart select processes when they terminate. Prevent sleep Process Lasso can prevent your PC from sleeping for a specified amount of time, or when select processes are running. Dynamically disable Hyper-Theading / SMT Dynamically disable Hyper-Threading and SMT on a per-process basis. Advanced Watchdog Rules Create advanced rules to perform a specified action when matched process(es) reach a certain threshold of resource consumption or other criteria. Automatic game detection Detects when you are running a game, such as a Steam game. Multi-select operations Perform an operation like terminate multiple processes at once! Configuration profiles Profiles allows for creation and use of multiple configurations. 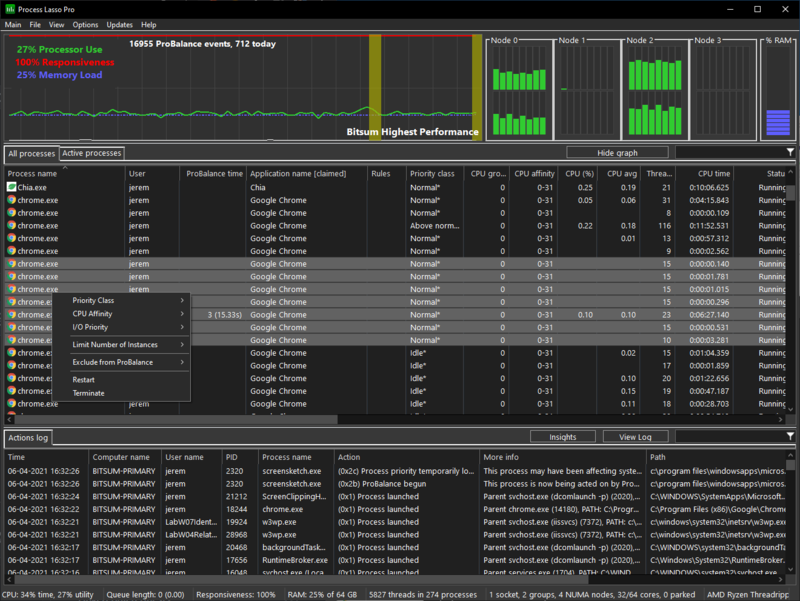 Much more … Process Lasso contains numerous other features and functions. Explore them for yourself! Wildcards are accepted in most rules. Please remember that while Process Lasso offers a plethora of advanced tweaking capabilities, it works out-of-the-box, so we not recommend the average home user tweak too much. It is easy to do more harm than good while trying to eek out a marginal performance gains. Process Lasso’s Bitsum Highest Performance power plan (Peerformance Mode) combined with ProBalance is about as good as you’ll get regarding performance and responsiveness. 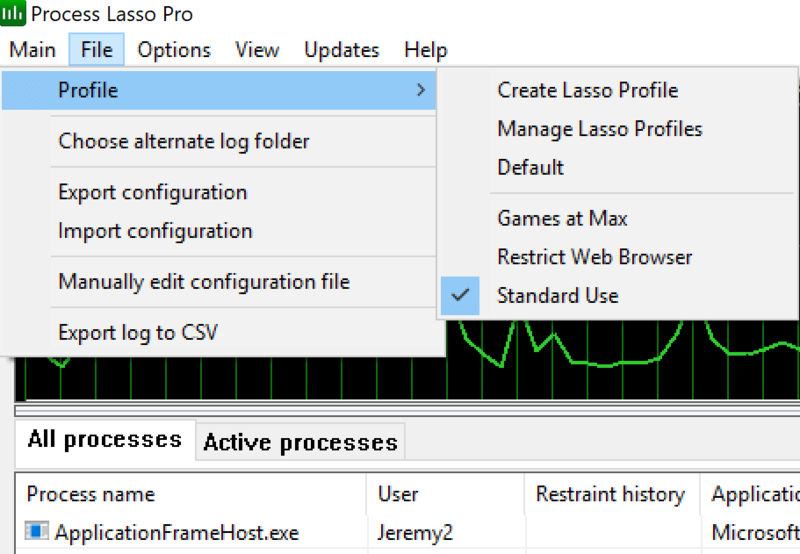 Process Lasso has a robust ability to set default priority settings for a process. 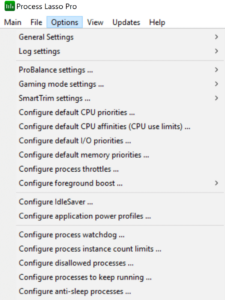 This includes the CPU priority class, I/O level, and memory priority. 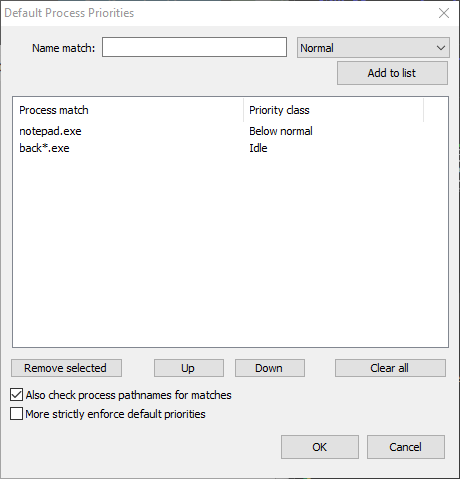 The dialogs below emphasize this point, though these options are also easily accessible via the process context menu (right-click) within Process Lasso’s GUI. 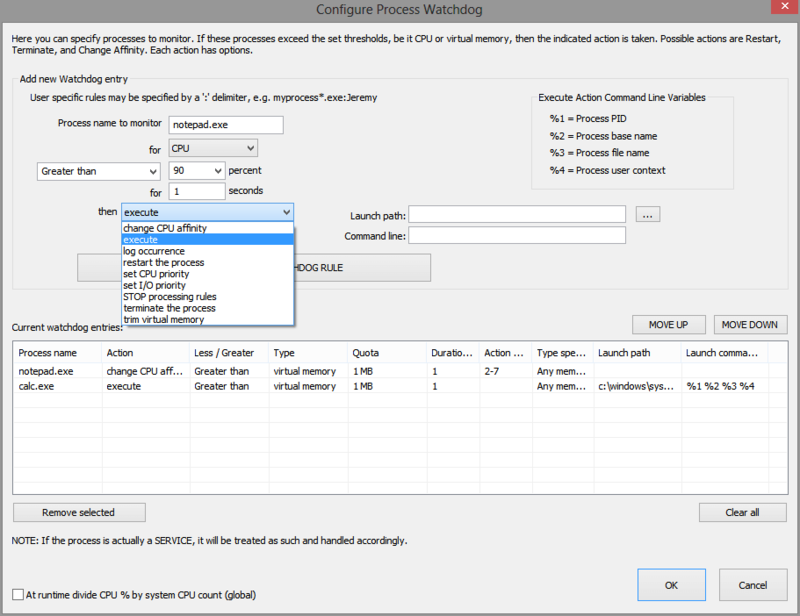 Process Lasso has a robust ability to set default CPU affinities. The CPU affinity of a process is simply the set of logical cores that the process is granted access to. Remember, this inherently constrains a process, limiting it’s threads to acting only on a specific set of CPU cores. Custom CPU affinities can be used for a number of purposes, including a forced reduction in total CPU capacity able to be consumed by the target process. Go deeper with more advanced rules, which we call the ‘Watchdog’. The possibilities are countless. You can get to this via ‘Options / Configure process watchdog …‘. This will cause an automatic switch to ‘Gaming Mode’, now renamed ‘Performance Mode’. This is in the Workstation Edition only.